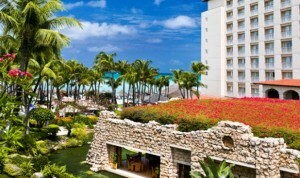 The Hyatt Regency Aruba Resort & Casino was the first “Green Globe Certified” high-rise resort in Aruba. This magnificent vacation haven, which spans 12 acres, embodies the ultimate in resort experiences by combining a laid back, island atmosphere with luxurious services, amenities and accommodations. Its Palm Beach, north Aruba location, and juxtaposition of Spanish, Caribbean, Portuguese and Dutch decor, is setting a new standard for passionate vacations and enchanting destination weddings. Revel in the full-service European spa that features all-natural, mineral mud facial and body treatments. 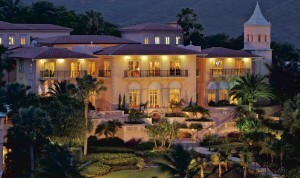 Relax in the three-tiered swimming pool with a waterfall, 2-story water slide and adjacent tropical flower gardens. Re-invigorate at the on-site fitness center. A kid’s playground and video arcade allow your little ones a place of their own on the resort’s grounds. 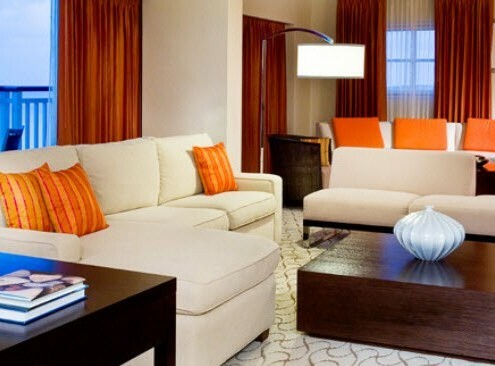 Each of the Hyatt Regency Aruba Resort & Casino’s hypo-allergenic guest rooms and suites feature a Healthway air purifier, allergen carpet and upholstery shields and hypo-allergenic pillow and mattress encasing. The rooms also have Wi-Fi, satellite cable TVs, individual climate control and mini-bars. Suite upgrades include varying amenities, including multiple bedrooms, private, furnished balconies, in-room Jacuzzis and wet bars. 24-hour in-room dining is available in all guest room and suite choices. Sample freshly squeezed tropical fruit juices at the Kadushi juice bar. 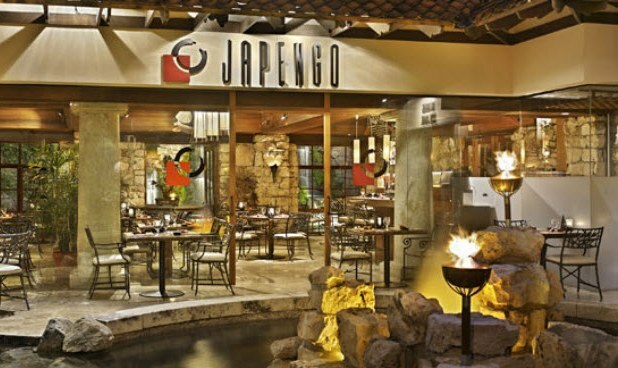 Eat innovative cuisine at several on-site gourmet restaurants, including Cafe Piccolo Italian Restaurant, Palms Latin Bistro, Footprints Beach Grill and Cafe Japengo Pan-Asian eatery. 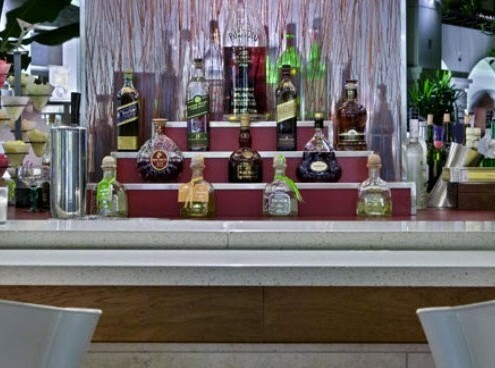 Sip on signature alcoholic and non-alcoholic concoctions at the open-air lobby bar, casino bar, beach bar and pier bar. 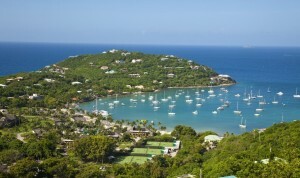 Adventure in snorkeling, scuba diving, catamaran sailing, tennis or basketball while on the resort. The facility’s staff also coordinates exciting daily activities, including water balloon tosses, karaoke, bingo and scavenger hunts. Venture off to the nearby Robert Trent Jones II-designed 18-hole, championship golf course. 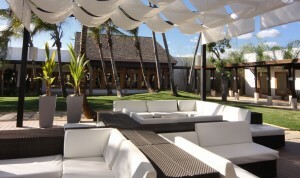 The resort also houses over 9,000-square-feet of meeting space to allow you to throw your own work or social event. 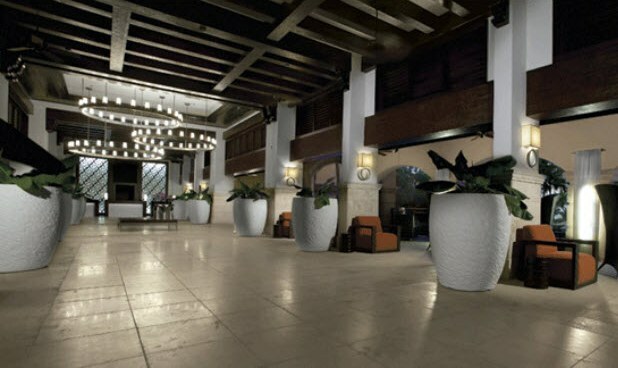 Newly remodeled, spacious 380-sq.-ft. rooms located on the 3rd floor, offer rooftop views of the resort’s open-air Spanish architecture, lush gardens and cascading waterfalls. The rooms have windows that open, but no balconies. All Queen/Queen guestrooms include a bathtub. 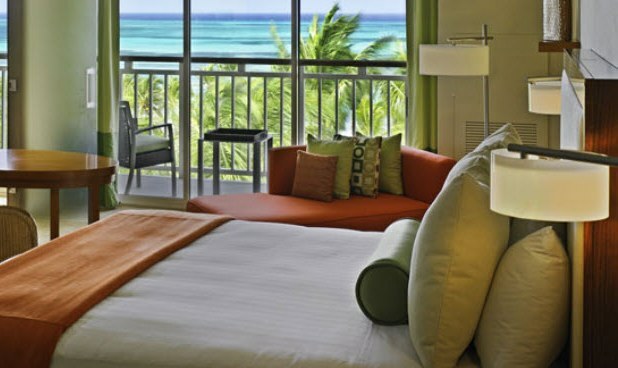 Enjoy the deluxe amenities in our air-conditioned, beachfront Aruba lodging including refreshing ceiling fan, Portico bath products, iHome clock/radio, coffeemaker, minibar, 32″ LCD TV, high-speed Internet access and daily newspaper. 1 king bed or 2 queen beds. Newly remodeled, spacious 380-sq.-ft. rooms offer a private step-out balcony, perfect for enjoying views of the tropical gardens and courtyard. All King rooms include a shower while the Queen/Queen guestrooms include a bathtub. Enjoy the deluxe amenities in our air-conditioned, beachfront Aruba lodging including refreshing ceiling fan, Portico bath products, iHome clock/radio, coffeemaker, minibar, 32″ LCD TV, high-speed Internet access and daily newspaper. 1 king bed or 2 queen beds. Newly remodeled on the upper floors, these spacious 380-sq.-ft. rooms offer a private step-out balcony, perfect for enjoying views of the ocean, tropical gardens, courtyard and the island. All King rooms include a shower while the Queen/Queen guestrooms include a bathtub. Enjoy the deluxe amenities in our air-conditioned, beachfront Aruba lodging including refreshing ceiling fan, Portico bath products, iHome clock/radio, coffeemaker, minibar, 32″ LCD TV, high-speed Internet access and daily newspaper. 1 king bed or 2 queen beds. Newly remodeled on the upper floors of our resort, these spacious 380-sq.-ft. rooms offer a private step-out balcony, perfect for enjoying views of the ocean, three-level pool, lagoon and tropical gardens. All King rooms include a shower while the Queen/Queen guestrooms include a bathtub. Enjoy the deluxe amenities in our air-conditioned, beachfront Aruba lodging including refreshing ceiling fan, Portico bath products, iHome clock/radio, coffeemaker, minibar, 32″ LCD TV, high-speed Internet access and daily newspaper. 1 king bed or 2 queen beds. Located on Floors 2, 3, 4, 6 7 and 8, Ocean Front View Kings offer a glorious view of the Caribbean Sea from the furnished balcony. All rooms include a shower. The spacious full bath includes pampering Portico products and plush robes. 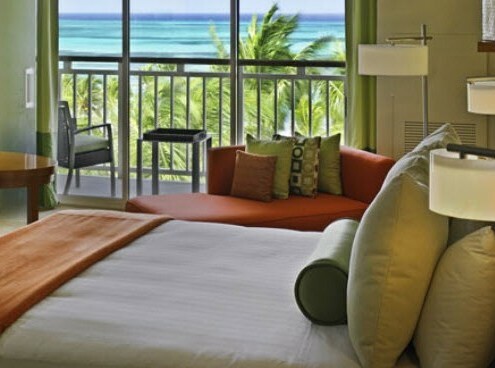 Additional deluxe amenities in our air-conditioned, beachfront Aruba lodging including refreshing ceiling fan, Portico bath products, iHome clock radio, coffee maker, minibar, 32″ LCD TV, high-speed Internet access and daily newspaper. 1 king bed. Newly remodeled, where a welcoming seating area in the parlor lets you enjoy the fantastic view of the ocean or watch the large, plasma TV. Open the sliding door to your private step-out balcony, and let the fresh island air wash over you. All King rooms include a shower. Enjoy the deluxe amenities in our air-conditioned, beachfront Aruba lodging including refreshing ceiling fan, Portico bath products, iHome clock/radio, coffeemaker, minibar, 32″ LCD TV, high-speed Internet access and daily newspaper. The couch converts to a comfortable sofa bed, large enough for two guests. In the master bedroom, you’ll find an extremely restful king size Grand Bed as well as a cozy seating area. 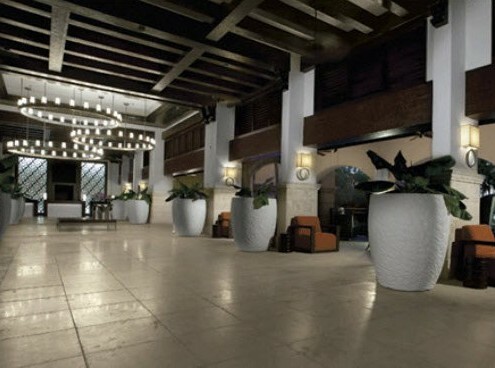 Family suites are located at the beginning of guest’s hallways, on the 5th, 6th, 7th, and 8th Floors. The bathroom, with its modern shower system, is located between the 378-square-foot living room and the Master bedroom. The bedroom features a beautiful Island view, while the parlor has an ocean / pool view. 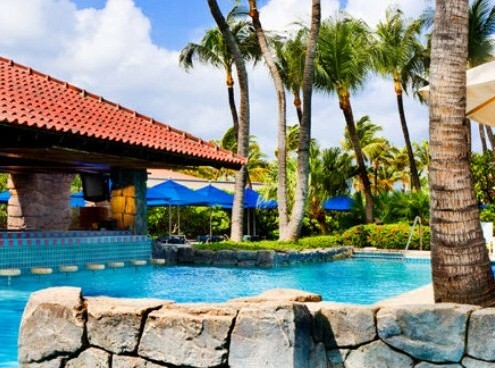 Reward yourself with the pampering luxuries of these exclusive, newly remodeled Aruba accommodations. Begin each day with a complimentary Continental Breakfast in the private lounge, where you may also enjoy evening hors d’oeuvres and wine. Situated on the top level of the resort, each spacious room within this private floor offers gorgeous ocean or island views from a step-out French balcony. All King rooms include a shower. 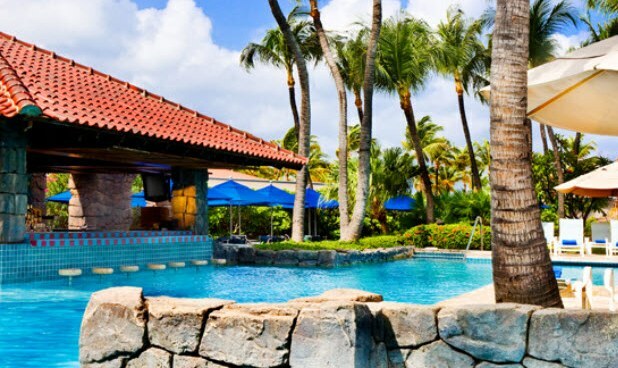 Enjoy the upgraded amenities in our air-conditioned, beachfront Aruba lodging including plush robes, refreshing ceiling fan, Portico bath products, iHome clock/radio, coffeemaker, minibar, 32″ LCD TV, high-speed Internet access and daily newspaper. Relax in the Regency Club Lounge with other club members while enjoying a stunning ocean view. 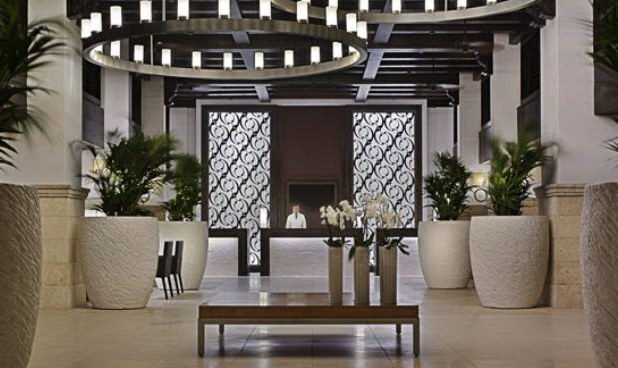 The dedicated Regency Club Concierge staff is on duty from 6:00 a.m. to 8:00 p.m. each day for your convenience. Please note, this level is a non-smoking floor. One-bedroom, newly renovated suites located on Floors 2, 3, 4, 6 and 7. Sunset Suites offer an elegantly furnished sitting area with a couch that converts to a comfortable sofa bed, large enough for two guests, a glorious view of the Caribbean Sea from the furnished balcony and a king Grand Bed. All King rooms include a shower. The spacious full bath includes pampering Portico products and plush robes. 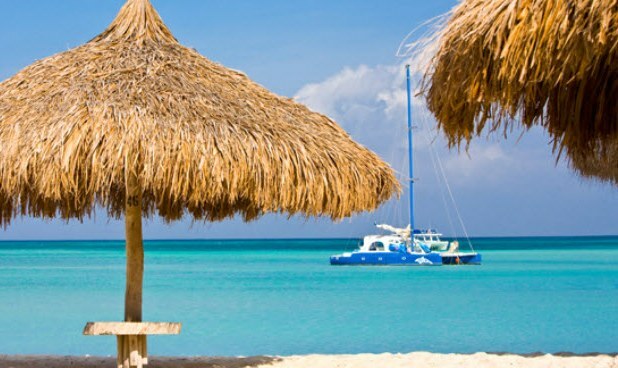 Additional deluxe amenities in our air-conditioned, beachfront Aruba lodging including refreshing ceiling fan, Portico bath products, iHome clock/radio, coffeemaker, minibar, 32″ LCD TV, high-speed Internet access and daily newspaper. Newly renovated Cayena Suites, located on the 3rd, 4th and 5th Floors, are available in your choice of one, two or three bedrooms. As a one-bedroom, this luxurious suite offers a king bed with a huge furnished balcony, a couch that converts to a comfortable sofa bed, large enough for two guests and a bathroom with a shower. As a two -bedroom suite, the second bedroom features two queen beds with a furnished balcony and a bathroom with a bathtub. As a three-bedroom suite, the third bedroom offers a king bed with a bathroom and a rainforest shower. All King rooms include a shower while the Queen/Queen guestrooms include a bathtub. No matter the combination you select, you will enjoy the incredible view of the ocean from the welcoming seating area or a private balcony. 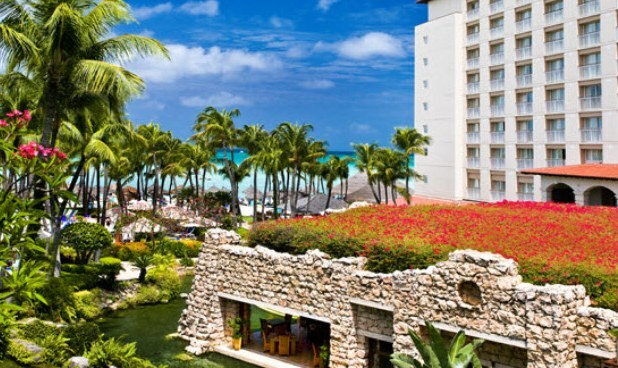 Enjoy the deluxe amenities in our air-conditioned, beachfront Aruba lodging including a 32-inch LCD TV, refreshing ceiling fan, Portico bath products, iHome clock/radio, coffeemaker, minibar, high-speed Internet access and daily newspaper. 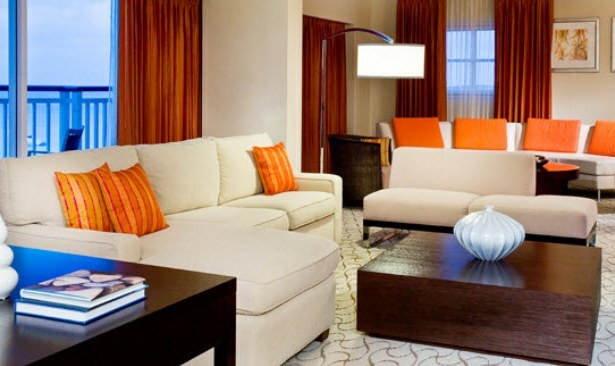 Elite one or two-bedroom Suites, located on the ninth floor, Regency Club level. A soaring cathedral ceiling welcomes you to this opulent suite with its defining characteristic of two guest room-sized fully furnished rooftop terraces on each side. With a large living room (as big as three guestrooms), a half bathroom, the Governors Suite redefines luxury with a full furnished balcony that extends the full length of the room, affording a stunning view of the Caribbean Sea. All King rooms include a shower while the Queen/Queen guestrooms include a bathtub. Relax in the soothing Jacuzzi in the spacious, deluxe master bath. The master bedroom opens up onto one of the furnished terraces for your quiet reflection upon gardens and nature. The second bedroom offers a king bed. 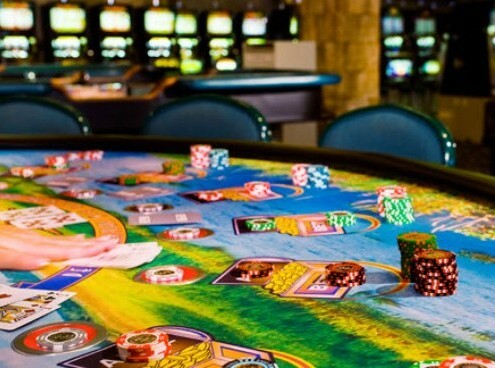 Enjoy the deluxe amenities in our air-conditioned, beachfront Aruba lodging including refreshing ceiling fan, Portico bath products, iHome clock/radio, coffeemaker, minibar, 32″ LCD TV, high-speed Internet access and daily newspaper. 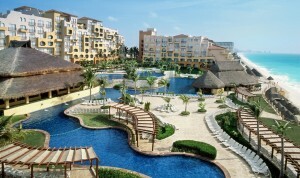 Choose either a one-bedroom, two-bedroom or three-bedroom suite on the 8th floor. The deluxe living room area is as large as three guestrooms, furnished with a conference table for eight people, a full bathroom with a stall shower, steam shower, and bathtub, and a spacious furnished balcony that runs the full length of the living / conference area. 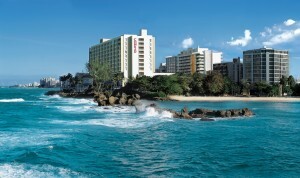 The one-bedroom suite offers a king bed and a balcony with a magnificent oceanfront view of the Caribbean Sea. The master bedroom opens up to the living room. As a two- bedroom suite, the second bedroom has a king bed with an oceanfront view. The three-bedroom suite offers two queen beds, with an ocean / pool view or ocean / garden view from the French balconies. All King rooms include a shower while the Queen/Queen guestrooms include a bathtub. Enjoy the deluxe amenities in our air-conditioned, beachfront Aruba lodging including refreshing ceiling fan, Portico bath products, iHome clock/radio, coffeemaker, minibar, 32″ LCD TV, high-speed Internet access and daily newspaper. Each of these suites, located on the 8th and 9th floors, may be configured to create either a one-bedroom or two-bedroom suite. Within the suites, you’ll enjoy a living room / parlor area with an ocean / pool view from two French balconies, a full bathroom and a wet bar. As a one-bedroom suite, the Master bedroom features his and hers bathrooms (for a total of three). As a two-bedroom suite, the second bedroom includes two queen beds. All King rooms include a shower while the Queen/Queen guestrooms include a bathtub. 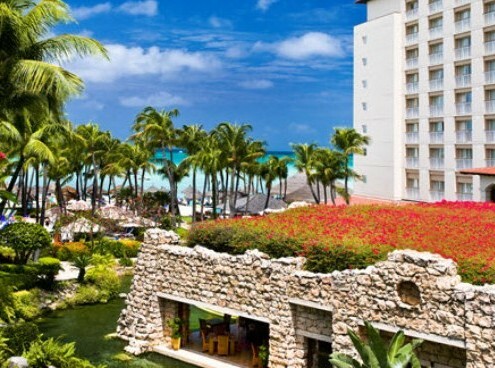 Your stay in our air-conditioned, beachfront Aruba lodging is further enhanced by deluxe amenities including refreshing ceiling fan, Portico bath products, iHome clock radio, coffeemaker, minibar, 32″ LCD TV, high-speed Internet access and daily newspaper. 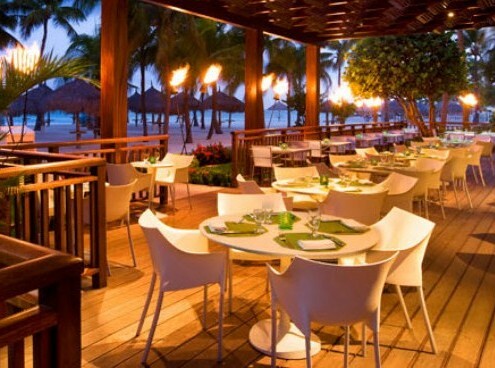 Ruinis del Mar – Sumptuous cuisine in the dramatic setting of our signature restaurant. A welcoming outdoor patio is bordered by a rustic wall built from indigenous Calichi limestone. Black swans and Koi swim peacefully around the surrounding lagoon, while landscaped gardens, bubbling fountains and a cascading waterfall form a peaceful oasis. Inside, the warm, elegant space offers lovely views of grounds from the walls of windows all around. 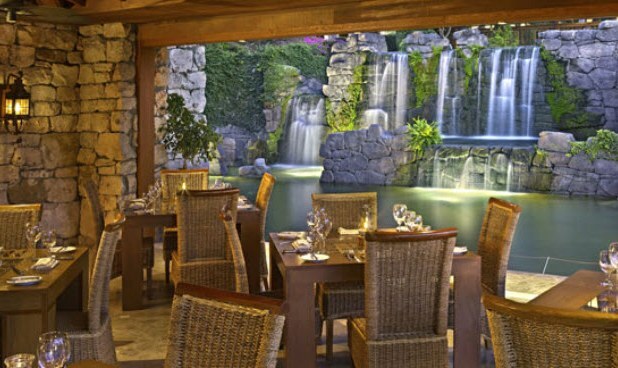 The culinary artistry of our team of Chefs completes this amazing dining experience. Our lavish Sunday brunch offers an opulent selection, with choices including breakfast classics, carving stations, freshly baked desserts and unlimited champagne and mimosas. Dinner: Monday through Saturday 5:30 p.m. to 10:30 p.m. Champagne Brunch: Sunday 9:00 a.m. to 2:00 p.m.
Open Wednesday through Monday 6:00 p.m. to 10:30 p.m.
Café Piccolo – This cozy bistro serves your favorite Italian classics, in a fun and inviting atmosphere. Take a seat at the bar surrounding our show kitchen, complete with a stone oven for baking made-to-order pizzas. 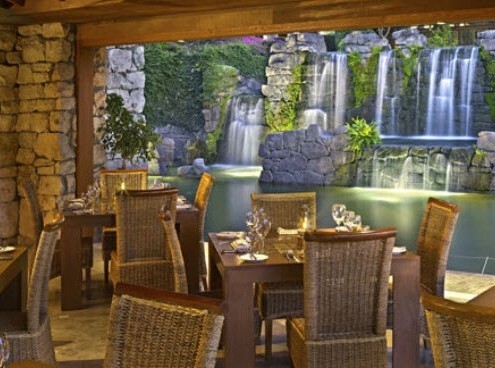 Relax at a comfortable table with a view of the fountain and garden. Hours: Tuesday through Sunday, 6:00 p.m. to 10:30 p.m.
Palms Restaurant – Indulge in authentic, fresh island dishes while enjoying the beautiful beachfront, either indoors or out. Martinis are prepared tableside. Savor the fresh flavors of Aruba. 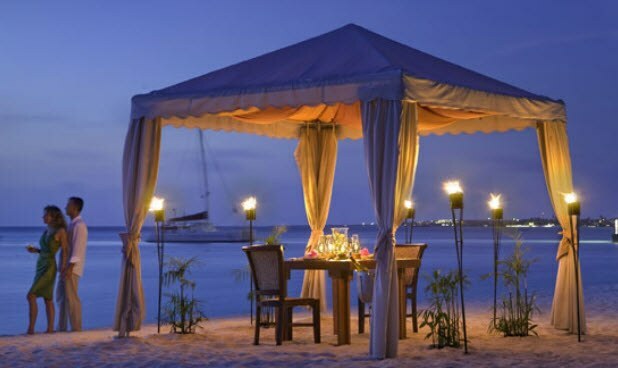 Footprints Beach Grill – This exclusive restaurant – only five tables are available each evening – offers fine dining while you wiggle your toes in the soft white sand. 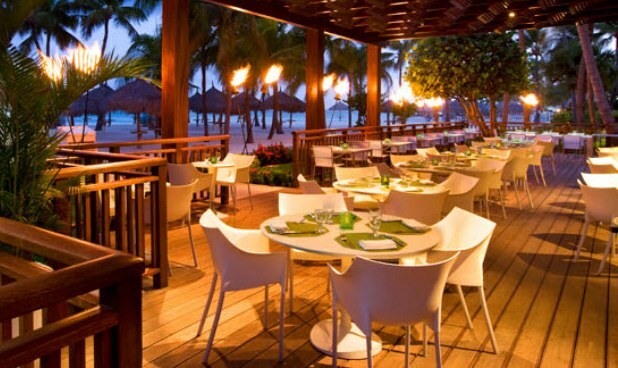 Enjoy the sounds of the sea as the attentive staff serves a delicious four-course dinner, featuring their renowned grilled entrees with your choice of beef, ribs, fresh seafood and more. Finish a delightful evening with a tempting dessert and your favorite cocktail or wine from the hotel’s extensive selection. Hours: Open daily, 6:30 p.m. to 10:00 p.m.
Palm Beach Aruba Bar – offers hand-rolled Cuban cigars and an extensive selection of exotic drinks, beers and wine. We cook and pour late into the evening, so you can enjoy the island’s flavors and sounds with our specialty cocktails, snacks and light meals whenever the mood hits. There’s no better place to sip your favorite frozen drinks and watch the sun set over the water before heading to dinner in one of our delightful restaurants. Sit back and enjoy your favorite sports program on our 46″ LCD screens or simply enjoy the entertainment. 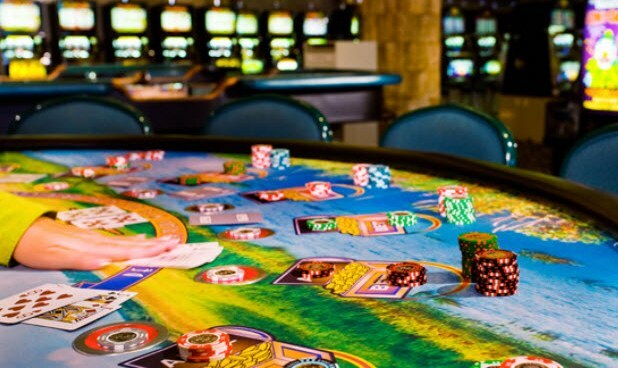 Hyatt Regency Casino Bar – Lush beachfront setting with dancing, music, gambling, great food and drinks. It all takes place against a backdrop of Caribbean-style modern interior design with bright, captivating colors, refined sophistication, and at-your-service professional staff. Hours: Daily, 11:00 a.m. to 4:00 a.m.
Piet’s Pier Bar – Gaze out onto the beautiful waters of the Caribbean as you savor a refreshing drink. 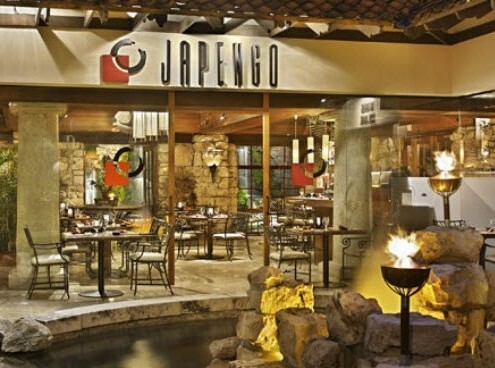 Take a break from the beach or in between games of tennis to relax at this casual gathering spot. Be sure to catch sunset here each evening for a sight not to be missed! Hours: 12 Noon – 11:00 p.m. 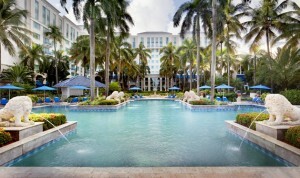 Pool: Three-level pool with slide and waterfalls, complimentary chaise lounges at pool and on the beach. Beach: Located on Palm Beach, a white-sand beach with watersports, tennis, and basketball; complimentary use of chaise lounges. Watersports: Red Sail Sports – exclusive diving and watersports operator for the Hyatt Regency offering complete scuba diving programs, sail cruises, and a full range of watersports toys for an additional charge. Other: Camp Hyatt – Supervised activities program for children 3 – 12 years of age, available daily at an additional charge.